In the fall of 2017, we went on a bike trip in the Rocky Mountains. It was a combined road-and-bike trip and challenged us in a few new ways compared to former trips. In this collection of articles that can be read as one long essay or as several short pieces we want to give an idea of challenges such as bringing bikes on planes low-cost, camping in bear country, or cycling in the snow, as well as present our personal experiences and the route we took. Wait, where are you going? By bike? Why? If you live in a country on a temporary permit, sooner or later there comes the point when you have to say goodbye. For José and me in Canada, this moment drew close in the summer of 2017 when we were both left without a work permit and only a few months of tourist visas remaining. Before moving to the True North we were convinced that we’d travel across the country during our year of working holiday, slowly making our way from Quebec to the west coast. But then we fell in love with Montreal and just stuck around – for over two years. Unwilling to leave, however, without having seen at least a little bit of the more emblematic natural sites of the country, it was clear to both of us that we wanted to visit the Rocky Mountains. First we thought my dad might join us and so we imagined something like a combined city and RV trip to British Columbia and Alberta, but when he opted out we were free to dream up a slightly wilder type of voyage. And thus, slowly and without neither of us really remembering how and when exactly, the idea of a bike trip emerged. We both have lots of fond (and a few grueling) memories of the cycling adventure we embarked on to kick off our “From Chile to Canada” trip across the Americas in early 2014. The slow pace and intensity at which one discovers a landscape, the direct exposure to the elements, the whole physical experience of challenge and reward were still something we would go back to and remember with quite a bit of nostalgia. It almost seemed like a natural fit to close off the Canadian chapter with another tour on two wheels. 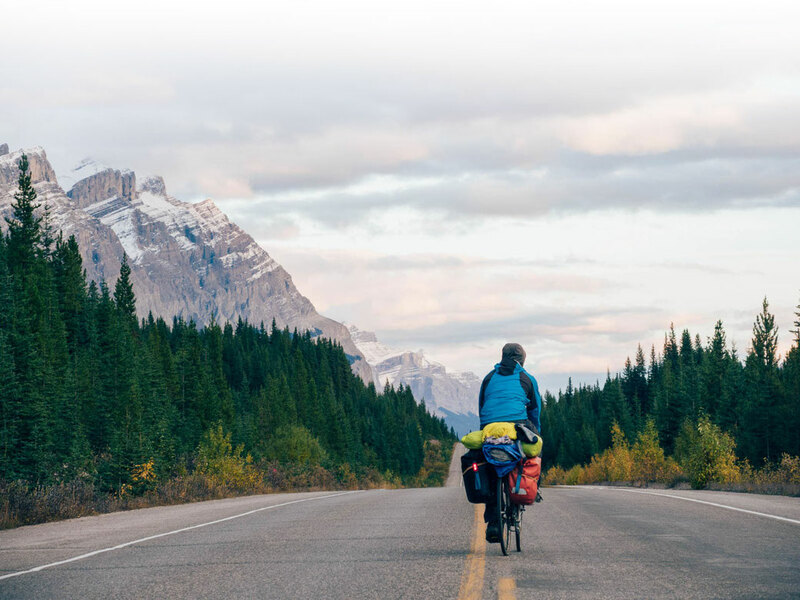 When a friend of ours started reminiscing about a trip she’d done several years before, our vision became clearer and clearer: We decided to cycle the Icefields Parkway, the famous scenic route that connects Jasper and Lake Louise in what is said to be one of the most beautiful parts of the Rocky Mountains (if not of the world! ).